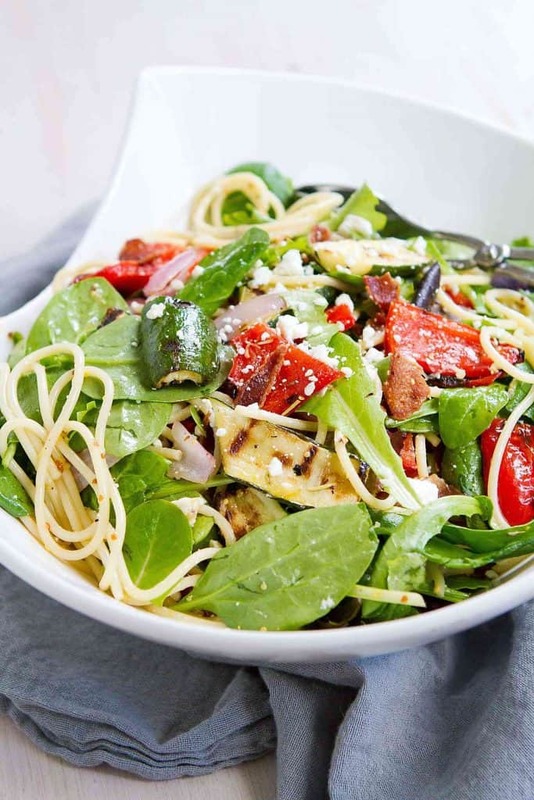 This Grilled Vegetable Salad with Bacon and Spaghetti is the perfect melding of flavors and textures. Great summertime salad! Thank you to Albertsons/Safeway for helping me share this recipe with you. The first time I was served a green salad with pasta mixed in, I remember thinking how bizarre that was. It was in a brewpub near our old house and the menu simply said “Caesar salad”, though it’s very possible that I just missed the pasta part when glossing over the salad choices. I’m always game for something a little different, so I dug right in. It didn’t take me long to realize that it was the perfect combination between a pasta salad, which is one of my all-time favorite meals (thanks, Mum! ), and a green salad. Now adding a cup or two of pasta is one of my easiest tricks when looking to transform a side salad into an entrée. However, since it’s grilling season and I had a package of bacon sitting in the fridge, I couldn’t stop with just the addition of pasta. This is one of those salads that can be adapted depending on your family’s preferences. Switch up the veggies based upon what’s available and feel free to add in additional protein, either meat (think grilled shrimp or chicken) or meatless (grilled tofu or canned beans). The sky’s the limit! I headed out to my local Safeway, where I do a good deal of my grocery shopping, and picked up some zucchini, red bell pepper and red onion. 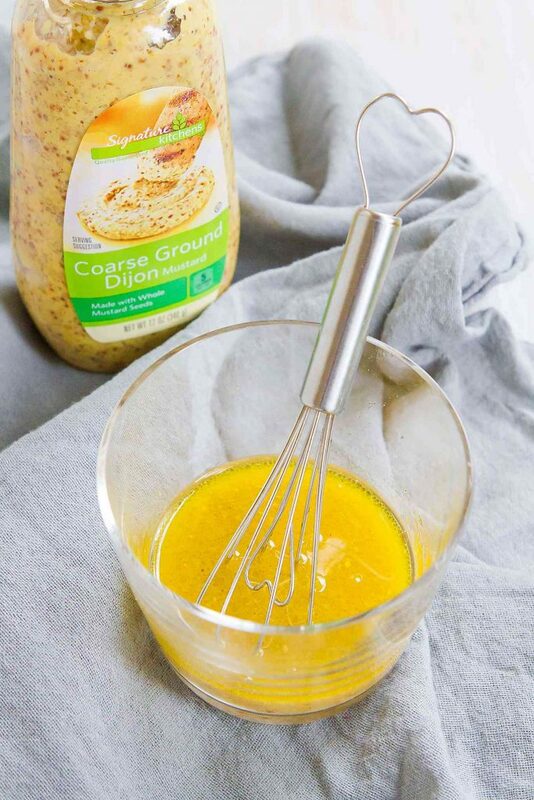 For the dressing, I threw some Signature Kitchens® Stone Ground Dijon Mustard into the cart, knowing I could use it to whip up a vinaigrette along with some white wine vinegar, olive oil and a touch of maple syrup for sweetness. 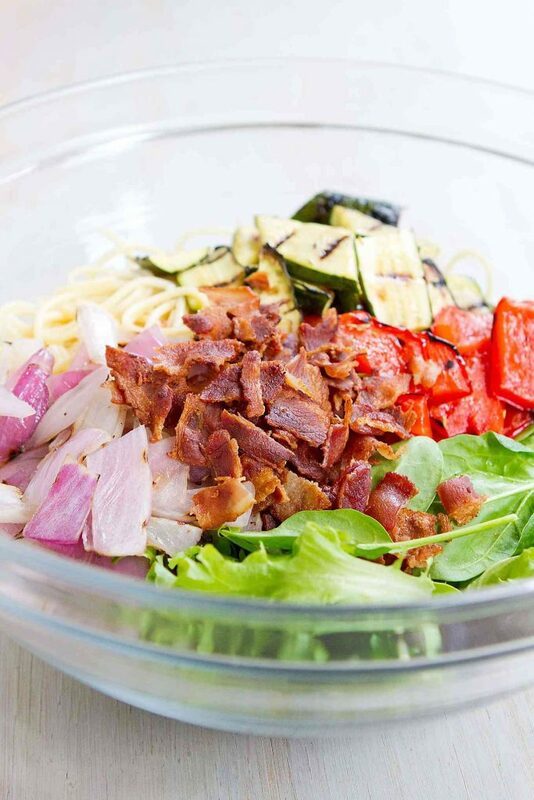 Add in a package of Safeway’s Signature Kitchens® spaghetti and the Signature Farms® bacon already in my fridge, and I had the mixings for an epic salad! The vegetables can be cooked either on an outdoor grill or in a grill pan. Once cut into grill worthy-sized pieces, toss in a little olive oil, crushed rosemary and a pinch of salt. Zucchini takes just a couple of minutes per side, while the red bell pepper and onion wedges takes a couple of additional minutes. This is one of those meals that’s perfect for multi-tasking. Grill then cool the vegetables while the pasta is boiling and the bacon is sizzling away in the pan. Once the dressing is made, everything can be combined in a large bowl and ready to serve in minutes. For a make-ahead version, prepare all of the individual components and refrigerate them separately. Toss the cooked pasta with a little olive oil to stop it from sticking together. Combine everything just before serving so that the salad greens and bacon stay crisp and fresh. My local Safeway had everything I needed for this recipe, and I used the bacon, spaghetti and coarse ground Dijon mustard from their Signature line, which includes more than 4000 items – everything from fresh produce and prepared foods to soup and coffee. If you don’t have a Safeway in your area, you can find the Signature line items at all Albertsons Companies stores, including ACME Markets, Jewel-Osco, Vons, Pavilions, Randalls, Tom Thumb, Shaws, Star Market, United Express, United and Carrs/Safeway. Oh yeah, and all of the Signature line products come with a 100% money back guarantee. High quality, great value and guaranteed – sounds like a win-win-win to me. Place the bacon in a large skillet set over medium heat. Cook until golden brown and crisp, turning occasionally. Transfer to a paper towel to drain. Break the spaghetti noodles in half and cook according to package directions. Drain and rinse with cold water. In a large bowl, combine the red bell pepper, zucchini and onion. Gently toss with the olive oil, rosemary and salt. Heat an outdoor grill or grill pan to medium-high heat. Cook the vegetables until lightly charred and tender, about 2 minutes per side for the zucchini and 2 to 3 minutes per side for the red bell pepper and onion. Transfer to a plate and cool to room temperature. Cut into bite-sized pieces, discarding the root end of the onion. 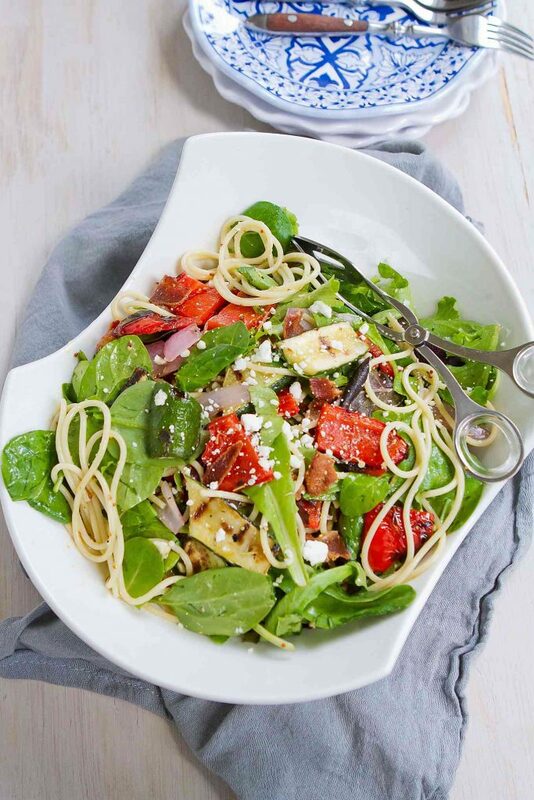 In a large serving bowl, combine the spring lettuce mix, cooked spaghetti noodles, roasted vegetables, basil and bacon. Toss with the dressing. Serve. In a small bowl, whisk together the white wine vinegar, Dijon mustard, maple syrup, salt and pepper. While whisking, slowly pour in the olive oil. Dara this is so creative! I would never have thought to put spaghetti in a salad, but now that I look at yours, it makes so much sense, what a fabulous summer meal! Such a great idea! My boys would this. I LOVE the idea of salad and spaghetti together. This is perfect for summer get togethers! So funny we just made a BLT salad with bacon too!! Tis the season for yummy salads! 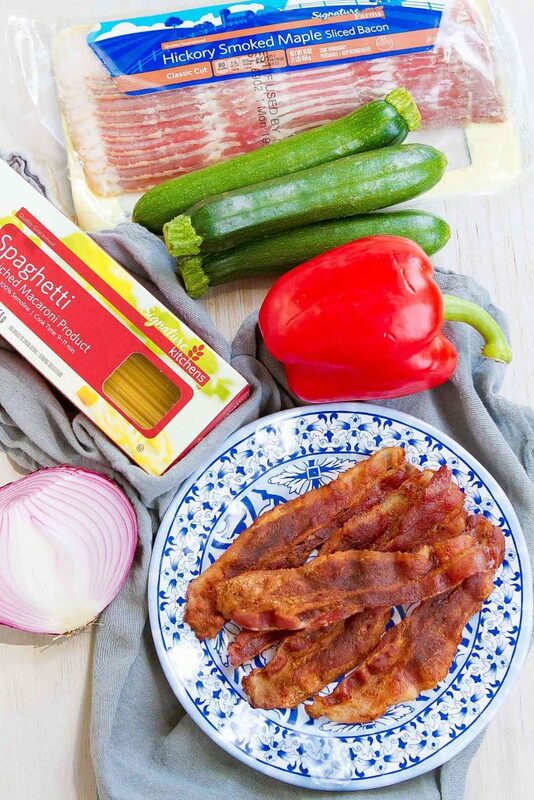 You got your healthy veggies with a little bacon and a little pasta…I’d say it’s my kind of perfect meal! Love this gorgeous salad. So perfect for summer! I love dinners that combine pasta with salad. I need carbs in my life, good for muscles 🙂 This one is going on our dinner menu!